Joker's latest crime is a hit on a fur store, in which he steals -- a hairpin? The story in "The Joker Trumps an Ace" and "Batman Sets the Pace" is loosely based on a comic-book story ("A Hairpin, a Hoe, a Hacksaw, and a Hole in the Ground") from Batman 53 (1949) — a bit too loosely, so that it doesn't quite make sense. 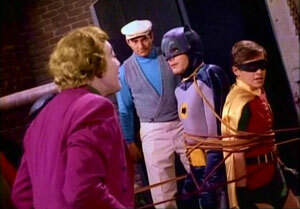 This episode, Tim and Paul discuss the source material penned by Bill Finger, and how Francis and Marian Cockrell's script removes the Hoe, the Hacksaw, and the logic. Also: Doesn’t Joker seem especially gay in this arc? Another Batman casting connection to Casablanca, and one to North by Northwest! Is Joker actually doing a rap, 13 years before “Rapper’s Delight”? And, what’s the basis for the “Batman running for California governor” gag?